Chemists from Russia and China have predicted a new superhard material that can be used in drilling, machine building and other fields. The new tungsten boride they discovered outperforms the widely used 'pobedit' ? a hard tungsten carbide and cobalt composite material with artificial diamond interspersing. The results of their study were published in the reputable scientific journal, The Journal of Physical Chemistry Letters. Superhard substances have a broad scope of application spanning well drilling, machine building, metalworking, defense industry, surgery and many other fields. The hardest known material, diamond is an unaffordable luxury in many applications. Its distant competitor, pobedit, has remained unrivaled for the last 80 years. Developed in the 1930s, it was used during the Second World War to make anti-tank shell caps (the word 'pobedit' is actually derived from the Russian 'pobeda' which means victory) and has been used for decades to manufacture drill bits for the drilling rigs. Harder materials either require higher-pressure synthesis or have much lower fracture toughness. 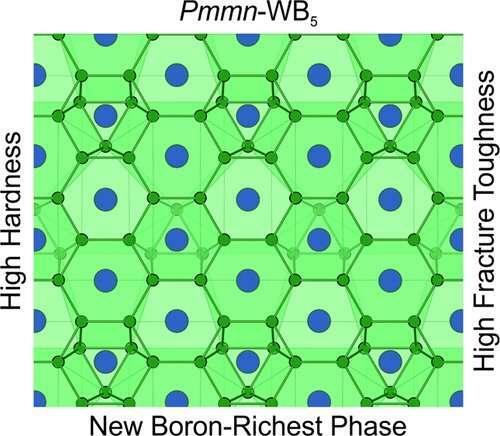 A team of Skoltech scientists led by Professor Artem Oganov used their USPEX evolutionary algorithm to predict a new material, WB5, that can be synthesized at normal pressure and can successfully compete with pobedit in the two most essential parameters ? hardness and fracture toughness ? which are 50% higher and 20% lower, respectively, for WB5 as compared to pobedit. The new material is a previously unknown compound that can be easily obtained under normal conditions. The Skoltech scientists performed their study within the framework of Gazprom Neft's large-scale project aimed at creating new materials for drilling applications.